The best gaming keyboard ever is the one that feels right when you’re playing. You have to choose carefully as there are many great keyboards out there, but also pretty bad ones with spongy keys. A good gaming keyboard uses mechanical switches and not silicone membrane switches, which feels mushy and obsolete. The scissor-switch also uses dome switches and silicone membrane, but are more stable. These switches are often used on laptops but can be found on a select number of dedicated keyboards too. For gaming purposes, however, you need a mechanical keyboard to get the best experience. The downside with mechanical keyboards is the price tag as they can get pretty expensive compared to other types of keyboards. 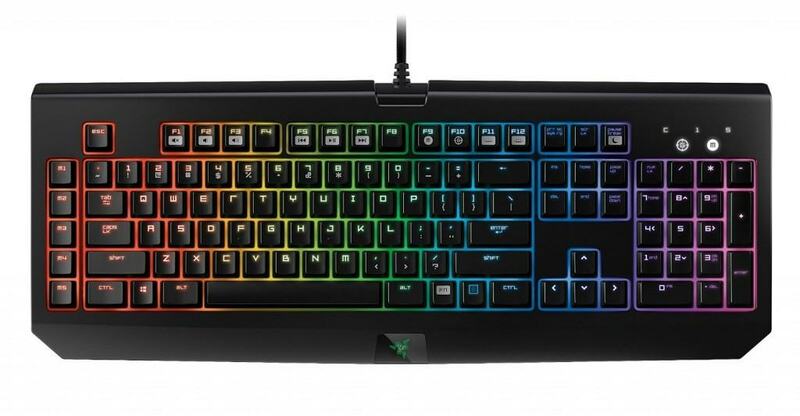 So what is the best gaming keyboard? The table below is a list of the best gaming keyboards out there today. Be sure to combine it with a good gaming mouse and the best gaming monitor for the ultimate gaming experience. When choosing a gaming keyboard, you also have to consider features and buttons. Back-lighting is a feature that many gamers request as it can illuminate the keys in a dark room and become very handy. 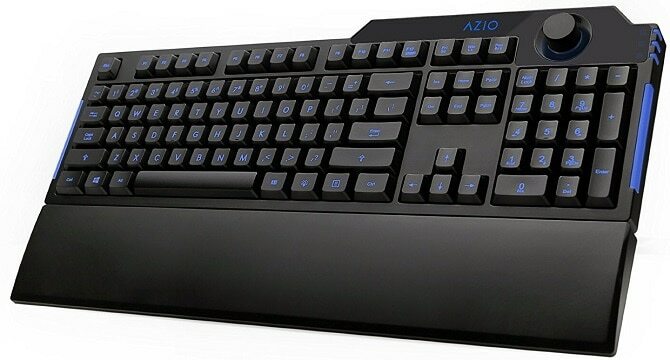 For gaming purposes, you want a wired keyboard for minimum delay, but if you’re looking for a wireless gaming keyboard or just a regular wireless keyboard, we’ve got some recommendations as well. We have composed a selection of the best PC keyboards for all budgets and use scenarios. Whether you’re a World of Warcraft raider or a CS: GO player or practically anything else, and whatever your budget is, we will most likely have your situation covered. If not, feel free to explain your situation in the comments below and we will recommend a keyboard for you. One of the best affordable gaming keyboards for 2018 is the YOUFU K2 which is designed for gamers with 19 most used keys calibrated for top-level performance and mechanical keyboard feeling. It’s available for only $20 and comes with a one-year warranty and a bunch of cool features including customizable backlight LEDs, water resistance, and it’s made of high-quality materials so that the characters won’t erase after long use. As an alternative choice in this category, we would also suggest having a look at the Azio Levetron L70 if the YOUFU is not appealing. The Levetron L70 has a wrist supporter too, but it only comes with a blue backlight. Are you ever in-game and want to adjust the volume very quickly? Well, the Levetron L70 has a volume adjustment knob that you can use to do just that. If programmable keys are a must for you, then you don’t have to spend a lot either for a quality gaming keyboard. Our top pick by far is the Redragon ASURA K501, which has 8 programmable macro keys, backlight illumination with 7 supported colors and 116 standard keys. The brightness of the backlight can be adjusted of course and it is also splash resistant (water resistant) meaning that if you spill something on it, the fluid will move through the drain holes without damaging the keyboard. The macro recording helps MMO fans access their favorite spell combos and macros at the touch of a single button, while the WIN keys can be disabled when gaming so that hitting the Windows key doesn’t cost you your promotion match. A lot of features have been compressed down to a decent sized peripheral of good quality. 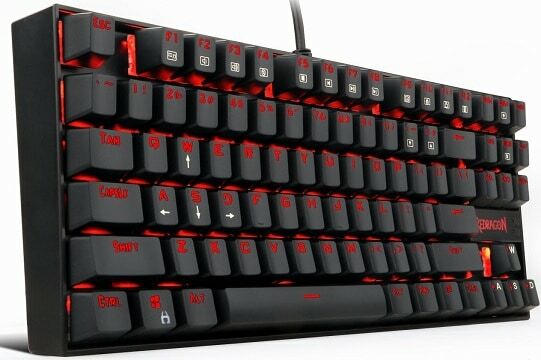 If you’re an MMO player, the Redragon is the best cheap gaming keyboard pick for you. If you are not satisfied with the budget gaming keyboards nor with the cheap mechanical keyboards (or any mechanical keyboard for that matter), you should consider getting a higher quality standard keyboard. 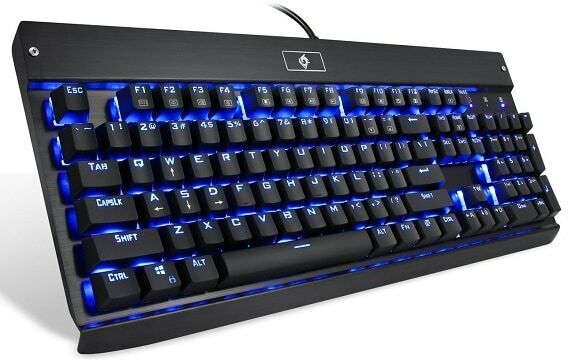 Some membrane gaming keyboards offer durable build quality, great performance, and advanced feature for programming the backlighting yet cost much less than certain mechanical keyboards which lack these traits. The Razer Deathstalker has only 2mm slim keycaps, so you can react faster than your opponents; due to such low-keycap chiclet keys, an ergonomic design, and the provided comfortable wrist-rest, we’ve found the Razer Deathstalker to be the best computer keyboard for typing in 2018 as well. In addition, the Razer gaming keyboard comes with the exclusive Razer Synapse 2.0 software which offers user-friendly customization and fully programmable macro configuration. 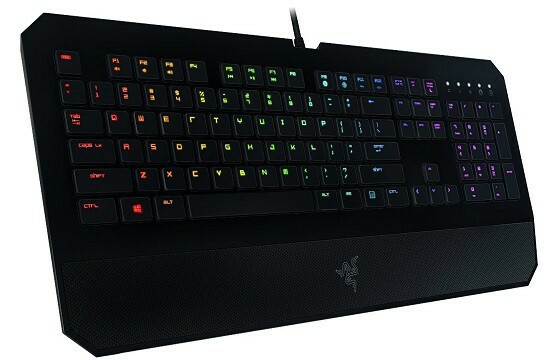 Unlike standard keyboards which can register maximum three simultaneous key presses, the Razer Deathstalker ensures anti-ghosting for up to ten. It’s available with green-only backlight, chrome, or without any for $10 less. 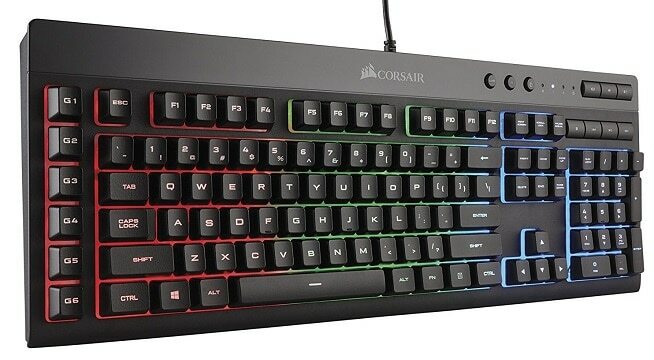 In case you’re after something similar but with added macro keys and media controls, check out the Corsair K55 gaming keyboard. It offers six macro keys, volume and media shortcuts, and a Windows Key Lock button so you can ensure you’ll never accidentally leave the game by pressing the windows key. Unlike mechanical keyboards, it’s very quiet and virtually equally responsive. The K55 also features three-zone dynamic RGB lighting, however, it’s not compatible with MAC as only the basic keys work. Overall, the Corsair K55 is definitely one of the best pc keyboards for 50 USD while the Deathstalker is the best Razer gaming keyboard for MAC and PC as well. As you may have noticed, different mechanical keyboards don’t only differ by models, but also by the type of mechanical switches distinguishable by colors. For some models, you can choose the type of the switch while others come in only one variant. There is a dozen of affordable mechanical gaming keyboards out there, but the best cheap mechanical keyboard is the Eagletec KG010 with stunning value for its price. The keyboard is very ergonomic and comfortable as well as water resistant and durable. It features blue Outemu switches which are great for both writing and gaming as they’re fast, precise, and provide the distinct clicky sound of mechanical keyboards. There are also 12 media keys and the option to disable the WIN key. 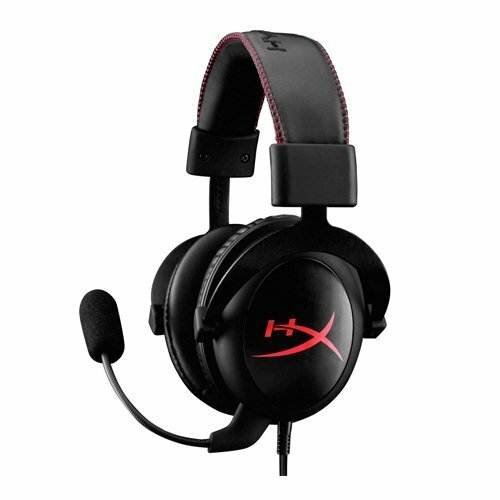 We’ve picked the model with blue LEDs though for extra $10 you can get the one with user programmable RGB backlighting. Overall, it’s the best mechanical keyboard for typing and gaming on the budget. 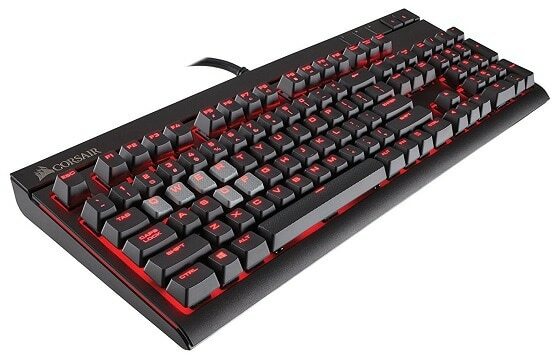 Alternatively, you could get the Redragon K552 Kumara for roughly the same amount the money, but this cheap mechanical keyboard lacks a numpad. If you want to invest a bit extra, look no further than the Corsair Strafe model available with Cherry MX Blue, Brown, Red, and Silent switches allowing you to pick the perfect mechanical keyboard for your needs at a reasonable price. The keyboard itself is absolutely gorgeous with separate FPS or MOBA textured keys for better grip and feel. Additionally, there’s a USB port for your headphones, phone, etc as well as dedicated media keys. It’s fully programmable for macros and all keys are 100% anti-ghosting. We’ve picked the RED LED backlit mechanical keyboard model as the fully RGB configurable models cost up to 30-60 USD. These do give you a cool ability to adjust separate color and effect for every key individually, but if you’re on a budget, it may be too pricey. Overall, the Corsair Strafe mechanical keyboard will provide you with everything you need as long as you pick the right switch type for you. The Blue Cherry MX switches give audible key presses and a clicky bump at the activation point when gaming. Brown Cherry MX switches have medium resistance and a tactile feedback with a bit less noise during the activation point. Lastly, Red Cherry MX switches have very low resistance and feel very, very smooth. They require very little effort to press and they provide reduced feedback noise. If you’re not sure which one to get, we recommend you go with the brown switch, as they’re in-between the red and blue. If you want the absolute best keyboard for gaming, you’ll be satisfied with either one of these. It’s also very important to pick the keyboard with the right type of keyboard switch for your gaming and typing preference. If you’re a competitive gamer looking for the fastest mechanical keyboard and price isn’t an issue, meet the Corsair K70 Rapidfire which currently holds the title as the best mechanical gaming keyboard for 2018. It offers all the goods as the previously-mentioned Corsair Strafe with extra features including fully customizable RGB backlighting. The K70 model with Cherry MX Speed switch provides you with stunning 1.2mm actuation as opposed to the standard 2mm. The software for making macros and adjusting RGB lighting is quite user-friendly and has tons of items to fiddle with, but you can also download presets created by other users. The Corsairs Rapidfire Cherry MX Speed keys are very smooth and actually rather silent – so you don’t have to worry about the loud clicking noise. All in all, if you’re looking for the best mechanical keyboard in 2018 for competitive gaming, the Corsair K70 Rapidfire is for you. 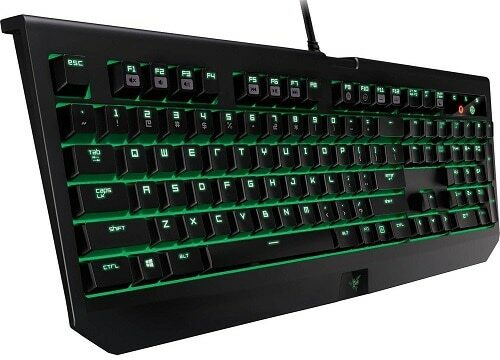 As an honorable mention and a cheaper alternative, we would also like to mention the Razer Blackwidow Ultimate keyboard. Razer uses their own key switches on the new mechanical keyboards and we’ve got to admit that they have done a pretty good job. They feel absolutely amazing, tactile and very responsive too, which is a characteristic of mechanical keys. With the Synapse software, you can customize all the keys including the five additional gaming keys with on-the-fly macro recording. The 10-key rollover also allows the anti-ghosting technology to execute up to ten commands at the same time. On the downside, this mechanical gaming keyboard backlight can glow only in green color though with six different lighting effects. If you’re looking for Razer keyboard for MAC, the BlackWidow Ultimate model is fully compatible. The Razer Orange switch is pretty much identical to the Cherry MX Brown while the Razer Green is similar to the Cherry MX Blue but with a shorter reset distance and a higher actuation point for gaming. Wireless and gaming do not go hand in hand, which makes a “wireless gaming keyboard” an oxymoron. We understand, however, that there are some people who want to go wireless and for those, we have concluded after countless of hours spent comparing wireless gaming keyboards, that the Logitech G613 Lightspeed is the best pick on the market right now. The G613 wireless gaming keyboard is a durable mechanical keyboard that can withstand up to 18 months of usage with only two AA batteries. The Lightspeed 2.4 GHz wireless technology ensures the minimal 1ms lag while Bluetooth connectivity allows for multiple devices to be connected to the keyboard, allowing you to swap on which device the keyboard is active by a simple press of a button. The Logitech G613 mechanical keyboard features Logitech’s own high-quality Romer-G switches which are similar to Cherry MX Speed as they are also only 1.2mm slim. Additionally, there are six programmable keys on the left side of the keyboard. The only downside is, the keyboard is not backlit and the wrist rest cannot be removed which may repulse potential customers – but then again, there are no other high-end wireless mechanical gaming keyboards available. Massively Multiplayer Online Role-Playing Game, also referred to as MMORPG, is a game genre that requires quite a lot of repetition, macros, and extra key bindings, and for that, you can use macros to make it much easier for you. A gaming keyboard designed for MMO games needs to have a lot of macro keys so that you can cast your favorite spell combos in one go. If you want to spend over $100, then we strongly suggest you consider the Logitech G910 Orion Spark. Countless comparisons that we have done show that this one is still the best in 2018. 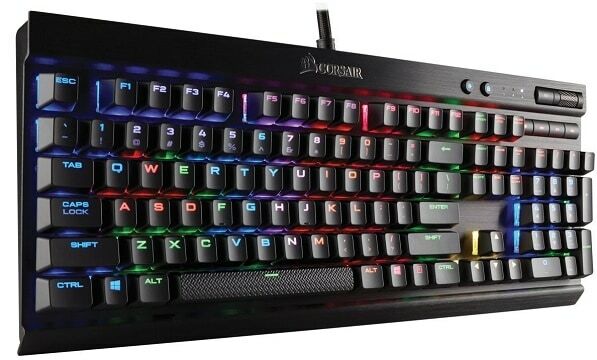 It is a full RGB keyboard, meaning that each key’s backlight can be customized and it comes with 9 programmable macro keys. The G910 Orion Spark allows you to have up to three unique, easily switchable profiles and it comes with large and small palm rest. What’s unique about this particular gaming keyboard is that it has exclusive Romer-G key switches, which are up to 25% faster and allows the Orion Spark to be one the fastest RGB mechanical gaming keyboard of all time in addition to having all the neat features for MMO gamers. As you most definitely have noticed, Windows and Mac do not have the same keyboard layout, which means that you are going to need a keyboard tailored for OS X to be able to see and use all the keys. Most keyboards will work fine OS X unless they explicitly state that it will not. Gaming on a Mac is not often practiced and most people with a Mac will just install Windows and use that for gaming and OS X for other tasks. You can use any of the previously mentioned keyboards for gaming on a Mac (we recommend Razer), but for general tasks and everyday use, we recommend just using an Apple Wired Keyboard. It’s not optimal for gaming but is great for everything else. We’ll have this section up for review so if you have another keyboard intended for Mac users, which is better, then feel free to write it in the comments below. A business keyboard needs to be ergonomic and optimized for maximum productivity. If you spend more time writing than playing on your PC, the following keyboard might be just for you! Features include a zoom slider in the middle of the keyboard, customizable hotkeys, email and internet hotkeys, extended number pad with popular symbols and a unique ergonomic design. This is an extremely popular keyboard and chances are that you have already seen it somewhere. That’s it! Hopefully, you’ve found the perfect keyboard for you. In case you are still undecided, we recommend the Corsair Strafe with Cherry MX Brown switches as the best keyboard for typing, gaming, and everything else with the best value/price ratio. If you’re on a really limited budget, we advise you save up at least for the Redragon K552 budget mechanical keyboard or the Corsair K55 standard keyboard with RGB lighting and macro keys depending on your preference.